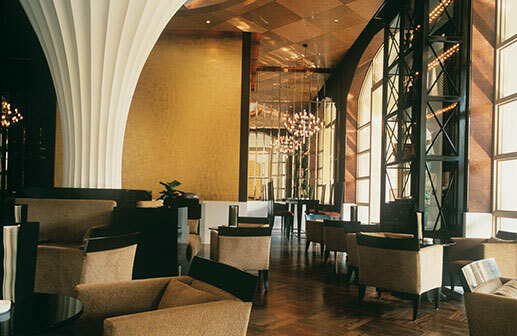 The Bar, adjacent to the lobby at Trident, Gurgaon, is stylish and chic. It is a perfect lounge for leisurely evenings in the company of family and friends. On offer is a premium selection of alcoholic and non-alcoholic drinks, complimented by a delicious menu of light snacks to help begin your evening or end your day. Sip on authentic French Champagne, Italian Brut, fine international and domestic wines, aperitifs, cognacs, liqueurs, Irish, American and Japanese whiskies, Champagne, classic and contemporary cocktails, as well as non-alcoholic slushes, lemonades and mocktails. Tantalise your taste buds with Moroccan grilled prawns, Japanese sushi rolls, steamed dumplings, nachos and much more. The Bar at Trident, Gurgaon is a wonderful setting to relax and unwind. The Bar is open from 9am to 1am. 09:00 a.m. to 01.00 a.m. Welcome to your perfect all-day workspace with free 100 mbps Wi-Fi, artisanal teas, single origin coffees, selection of small plates menu, personalized stationery and the service of a business concierge. Mixed doubles. Where work leads to play. As The Bar at Trident comes alive with innovative cocktails made using signature mixers, exciting small plates menu creatively served, cool music and ambience, every evening becomes less about timelines and more about time spent together. The very popular Wine hour continues at The Bar, with an unmissable '2 for 1' offer, every evening from 5pm to 7pm. Mood-elevating music and a delectable array of small plates are sure to keep your spirits high.